Astaxanthin by Pure Encapsulations is just an overall excellent product. I was recommended to take Astaxanthin as a potent anti-oxidant from my naturopath been taking it for 6 months for high inflammation levels. I have a high need for antioxidants and take 3 capsules of Astaxanthin by Pure Encapsulations per day as recommended by my doctor. I like that products by Pure Encapsulations are free of many fillers and binders. As you get older‚ your body becomes more susceptible to damage from oxidative stress. Oxidative stress is a normal bodily function that occurs when electrons attach to oxygen molecules in the blood. Antioxidants work to mop up excess oxygen molecules so they can't do damage to your DNA and cause diseases to develop. Antioxidant levels are usually the highest in brightly colored foods: for example‚ carrots are high in beta-carotene‚ which is a well-known antioxidant. Blueberries‚ leafy green kale‚ tomatoes‚ and cherries are some other examples of fresh‚ healthy foods that are packed with antioxidants. Eating a balanced‚ healthy diet rich in vegetables and fruits is important for this reason. One of the most powerful antioxidants—that you may not have heard of—is astaxanthin. This nutritional wonder is found in a type of algae that’s responsible for giving shrimp‚ lobster‚ salmon‚ and other seafood it’s red and pink coloring. If you don’t consume fish or shellfish regularly‚ you can easily add astaxanthin to your diet by taking it in supplement form. 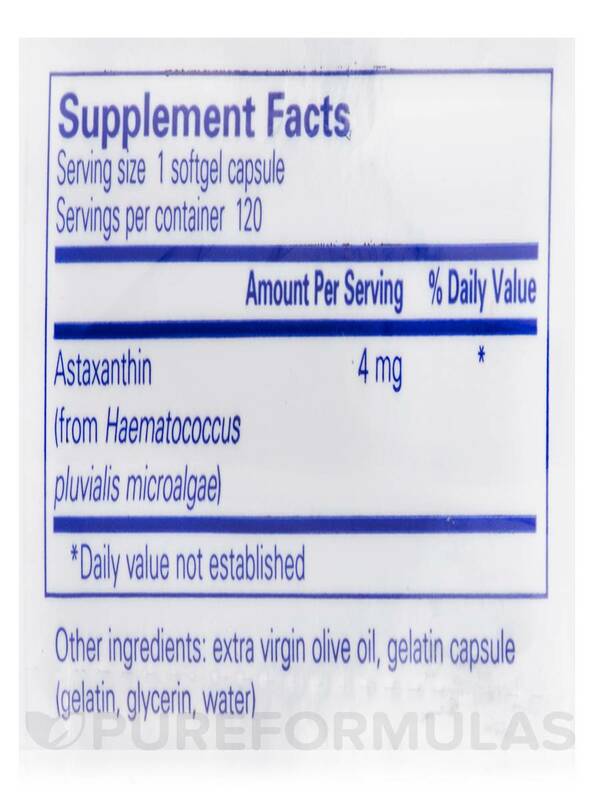 Pure Encapsulations’ Astaxanthin Softgel Capsules contain 4 mg of astaxanthin. Taking these helps ensure your body gets the antioxidants it needs to keep you healthy. This supplement may be beneficial for cardiovascular and immune system support; it may also be useful for maintaining healthy skin and eyes. It’s considered safe to consume in amounts normally found in food and has no known adverse side effects. Each softgel also provides 10 IU of vitamin E‚ in the form of d-alpha tocopherol. It also contains high-oleic safflower oil‚ in order to enhance absorption of the main ingredient. 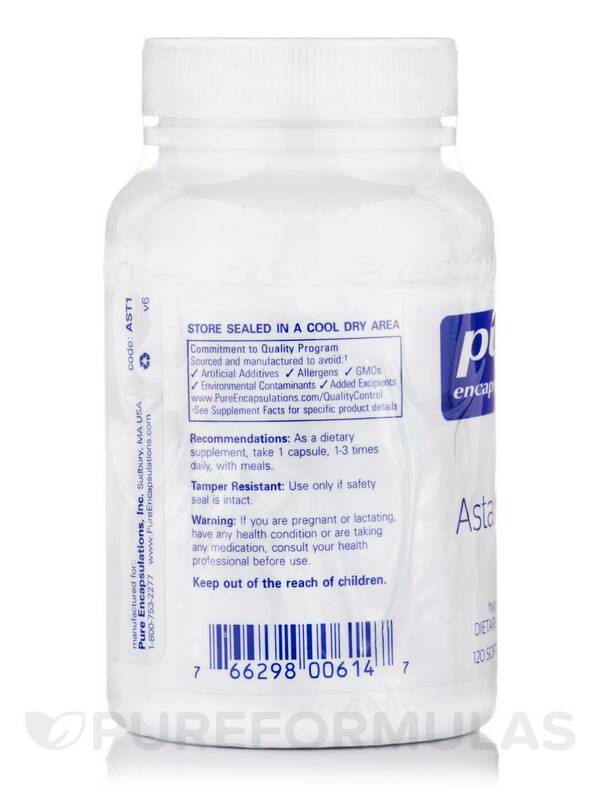 The recommended dosage of Astaxanthin by Pure Encapsulations is one to three capsules per day‚ taken with meals. One bottle will last from one to four months‚ depending upon your daily dosage. 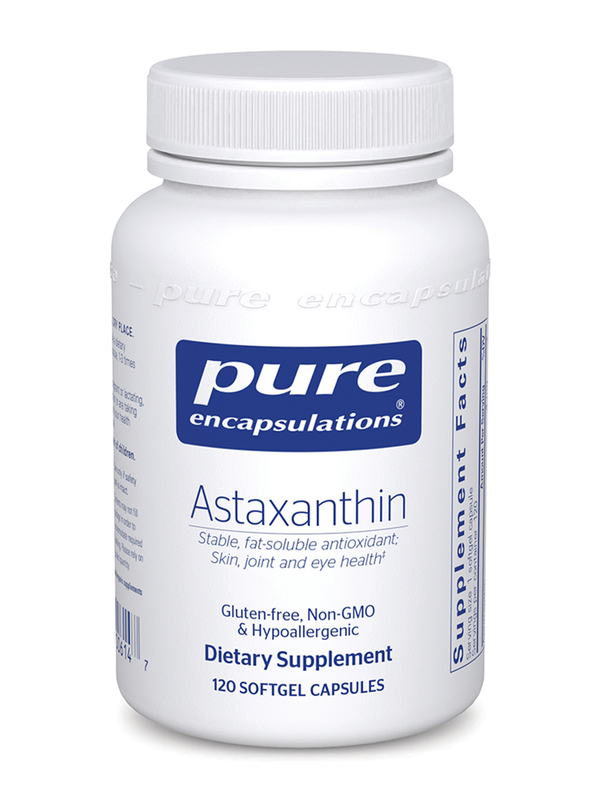 A naturopathic doctor recommended Astaxanthin by Pure Encapsulations and I have been using it for several years for my eye health. Every 6 months I have an eye exam, for macular degeneration, and my eyes have been stable since taking this product. I don't know if it helps but it is assuring that my eyes are not deteriorating. 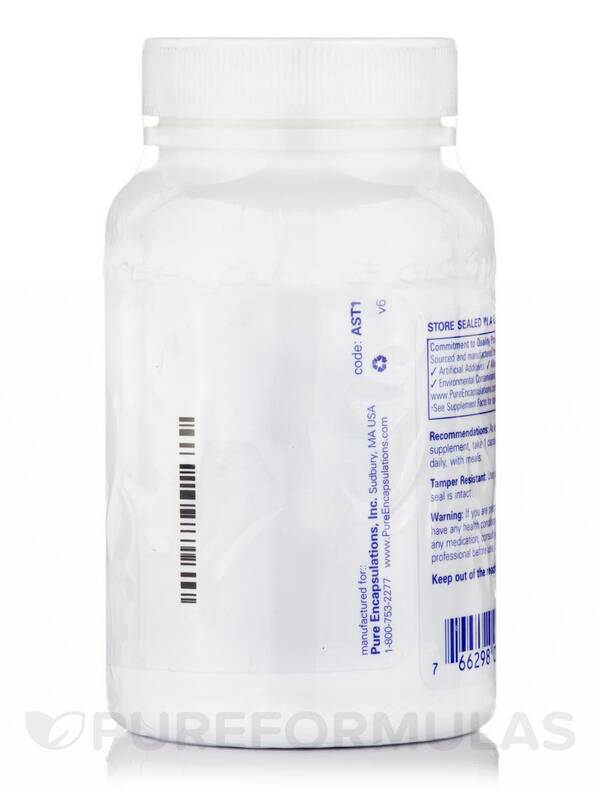 Products by Pure Encapsulations are free of a lot of fillers and binders. 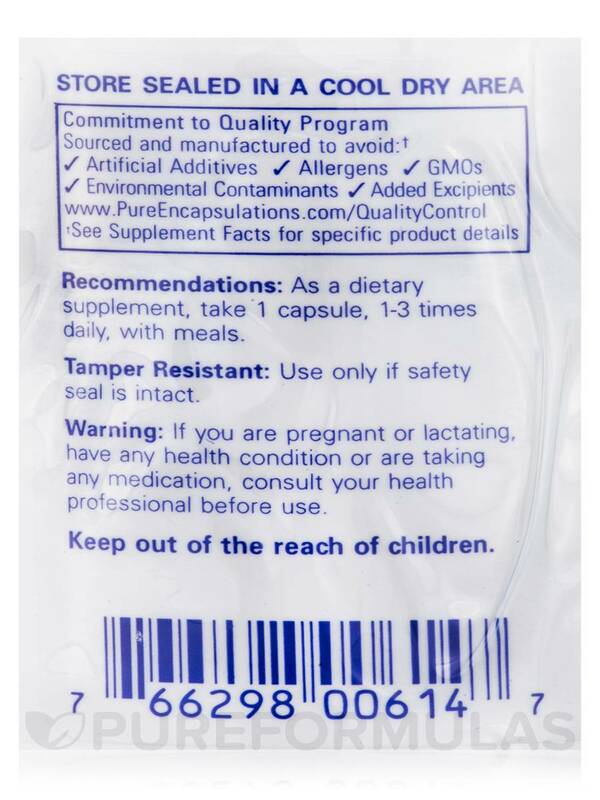 The gel capsules are small and easy to swallow. Hello,Thank you for choosing Pureformulas.com.This product is not suitable for vegetarians.Have a happy and healthy day.